Edward III was the eldest son of Edward II and Isabella of France, was born at Windsor in 1312, and succeeded to the throne, on the deposition of his father, in 1327. Although a regency was appointed, the chief power was held by the queen and her paramour, Roger Mortimer, Earl of March. 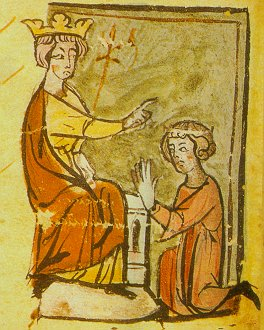 In 1328 Edward was married to Philippa, daughter of William III, Count of Holland and Hainault, and two years later he assumed the government, had Mortimer seized and hanged, and imprisoned Queen Isabella. In 1333 Edward invaded Scotland, which had been nominally subjected to England byEdward Baliol; besieged Berwick, and defeated the regent at Halidon Hill. The greater war with France soon withdrew his attention from Scotland. He assumed the title of king of France, invaded the country from Flanders, but without any successful result, renewed the invasion in 1340, when he defeated the French fleet at Sluys, besieged Tournay, and concluded a truce. The war was renewed and another truce made in 1348, to be broken the following year. In 1846 he won the great victory of Crecy, took Calais in 1347, and concluded another truce. During Edward’s absence in France the Scots invaded England, and were defeated at Nevil’s Cross, David II. being taken prisoner. Edward aimed at the acquisition of Flanders, hoped to get his son Edward, the Black Prince, made Earl of Flanders by the aid of Philip van Arteveldt and the free towns; but Philip was murdered in an insurrection at Ghent. In 1356 Edward, the Black Prince, invaded France, and gained the victory of Poitiers, taking the French king and his son prisoners. The king was released after four years on the conclusion of the peace of Bretigny. David of Scotland was released for a heavy ransom in 1357. War broke out again with France in 1369, and in 1378 John of Gaunt marched without resistance from Calais to Bordeaux. 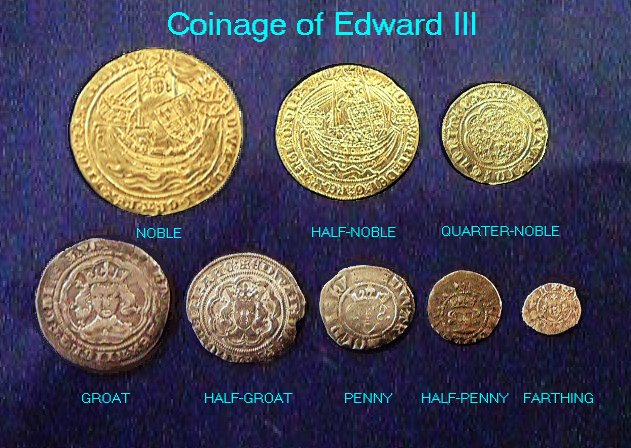 The long wars of Edward III., though almost fruitless of practical result, appear to have been popular; and his numerous parliaments granted liberal supplies for carrying them on, gaining in return confirmations of the Great and other charters, and many valuable concessions. His victories raised the spirit and also the fame of his country, and with the evident military power of England grew also her commerce and manufactures. In this reign John Wickliffe began his assault on the church of Rome; the order of the Garter was instituted, and the Round Tower at Windsor was hastily built by command of the king, to receive the round table for the new knights (1344): cannon began to be used in war; and the first English gold coin was struck. Edward died at Shene, now Richmond, June 21, 1377. By his queen Philippa, he had six sons and five daughters.